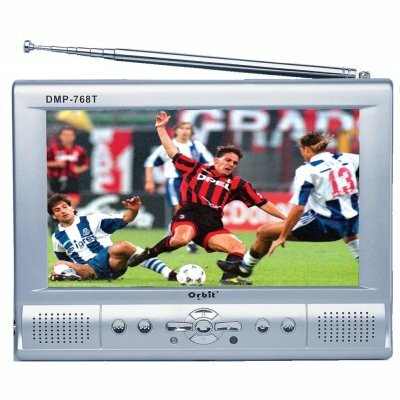 Successfully Added MP4/DIVX Player 40GB HDD, 7inch LCD Screen 480x234xRGB, TV to your Shopping Cart. Portable TV with 40GB HDD Media Player - Amazing functionality and price. MP4 Player function includes playback of DivX format video. Large 7-inch full colour screen and built-in stereo speakers. Receives the full range of terrestrial TV broadcasts. Built-in retractable aerial. You can connect it to a household TV aerial socket. Easy to use control panel on front of device. Built-in 40 gigabyte hard disk. Plays videos and MP3 music, and lets you view slideshows of your photos. Slim infrared remote control included. Rechargeable battery included plus mains power adapter. Fully portable and sturdy build quality. Comes in retail box with accessories. Switching power adapter input: AC90V-260V,50-60Hz, output 2.5A - The correct power adapter voltage and plug type will be selected by us for you according to your country.